One of the amazing birthday presents that I got this year was a kit from Badge-a-minit to make 1.25" buttons. I was inexplicably excited about it. But immediately drew a blank of what to put on my buttons. Skip ahead nearly two months. Tonight was the first Green Party meeting where myself and the other nominee (Lynn Morgan) were asked to speak about why we decided to become politicians. I'm one of those crazy process people who wishes that more people would care about politics. I wish more people would vote. And I wish more people would pay attention to the decisions other people make that affect everyones' lives. I get excited when I can make a difference in someone's life---when I can enable them to find their own voice and participate in their chosen community. Then I made them a deal. 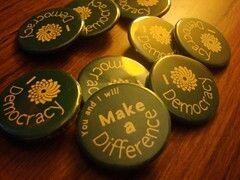 If they are successful in signing up one new member, they will get their own button which reads, "I ___ Green Party of Canada logo___ Democracy." I made the offer that anyone who was a lapsed member of the party could have one of the "I <3 democracy" buttons immediately if they signed the renewal form for their membership. There was only one lapsed member. The form was completed. The button exchange took place. People had fun. I could see in their eyes they were motivated to find a new member. Buttons are powerful like that. We're not even at the best part of the story though. These buttons are brought to you by open source and for those of you who also want buttons, here is the source (scroll down to the file attachments). It's an SVG file that you will be able to manipulate using Inkscape (and probably other free software programs too). The font is also open source, it's GentesqueBold for the small letters and Gentesque for the longer words. You can get Gentesque here. Create a circle to wrap the text around. Text will wrap around the outside edge of the circle. So make it a little smaller than the button size. Write the text that will wrap around the top of the circle. Select the text and the inner circle (hold down the shift key) and then open the Text menu and choose, "Put on path." The words should now wrap around your inner circle. If you need to rotate the words to be at a different angle: click twice on the words and then drag the corner around until the words are correctly positioned. In a new part of the screen make a new, larger circle to wrap the bottom words into. From the Path menu select "Object to path." From the Path menu again, select "Reverse." Your words will now be wrapped inside the circle. As before, type out your words and choose Text -> Put on path. This time the words will be wrapped into the bottom of the circle. Position the two circles on top of each other and fuss with the selection visibility so that all of the words are on top and all of the circles are on the bottom. Create a third large circle to act as a background wrap for the whole button. If you find the letters a little too crowded, adjust the letter spacing. Use the text tool to select the type you want to change. Then use the keyboard shortcut "alt >" to spread the letters apart and "alt <" to make the letters closer together. If you live in Bruce-Grey Owen Sound and you'd like your own button drop me a line (or leave a comment below). The same rules apply: sign up one friend before July 31, or renew your own lapsed membership, and get an "I <3 Democracy" button. Or if you've never been a member sign up for the first time and get a "You and I will make a difference" button. Supplies are limited, but I know how to make more. :) You can get a download-and-print style membership form online for the local group, or you can just sign directly with the federal Green Party online. Submitted by Dylan McCall (not verified) on July 19, 2010 - 9:53pm. Hey, I somehow had no idea you were a fellow Canadian, _or_ a Green Party person. Cool! Submitted by Olafur Arason (not verified) on July 20, 2010 - 4:36am. You know that you can clone a layer in inkscape which makes it easy to make a page full of identical buttons which can be easily changed. You just have to make the clone reference the name of the layer. Submitted by Rural (not verified) on July 20, 2010 - 6:16am. Well done Emma, you are already making a difference. Your fresh ideas and enthusiasm is catching and I hope it spreads throughout our riding. I am looking forward to meeting you soon. Kit?! Did someone say kit?! Submitted by Lynda (not verified) on July 20, 2010 - 7:58am. Kit?! Did someone say kit?! Gotta have it! Best selling title from O'Reilly media. Covers essential skills needed to use Git in a team environment. Available from O'Reilly media, and better bookstores worldwide. Practical how-to videos to get you, and your team, up and running with Git. A complementary video series for the book, Git for Teams. Site building for Drupal 7. Includes in-depth information on Drupal's most popular site building modules, SEO and accessibility. Two complete case studies are included in the book along with the tools you'll need to build (almost) any Web site with Drupal. The industry go-to for learning theming in Drupal 6. A great companion to Lullabot's book, Using Drupal. This Work, emmajane.net, is licensed under a Creative Commons Attribution-NonCommercial-ShareAlike license, although certain works referenced herein may be separately licensed.